Someone can save all the site? is good for artwork and maybe trasnlate to get some new information. 鋼竜鬼 = Koryuoni (?, Heavy Knight, dragonman or dragonewt, halberd). Attacks in front of the enemy, with a wave of range 3. It's purpose is a mystery. Don't like interactions bewteen humans and beasts. 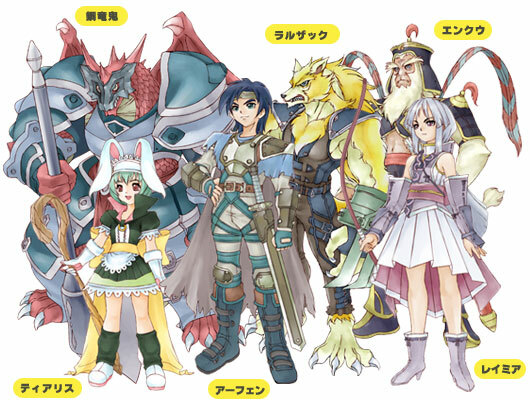 The 12 generals, led by the Lion King Diocles (ディオクレス), from the Bestia (ベスティア) country, are the core of the Shining Force to protect the world. They were called "12 Beast Kings". However, due to a war with the power of darkness, Beast Kings was halfed. 10 years passed, in Douz (ドゥーズ), capital of Bestia, called a festival to elect a new Beast King. Enku, a deeply injured priest of the Beast Kings, looks at a young treasure hunter raised as a swordman. He is qualified to be a challenger to became a Shining Force member, but because an old tradition, a variety of trials were wainting for him because he is a human being. Last edited by sulfuroxp on Thu Apr 11 2019 4:04pm, edited 2 times in total. I always thought Tiaris was a priest/healer, she looks like one and use wind magic. By the way, what is a pyontol? Theres no info about the bearded human and girl with white hair in the site, do you have any info about then? Enku is that human or that birdman of shining wind? The plot is around they wanting to become a member of shining force, one of the 12 beasts or replacing diocles as the beast king? really confused as diocles is alive theres no point in the later. I miss something, what bearded human or white haired girl??? Do you have the backup of S.Road 2 site??? Last edited by sulfuroxp on Thu Apr 11 2019 3:51pm, edited 1 time in total. In two of the arts of the game theres six characters. I think the one with beard is a monkey beastman, or a really ugly old man. I searched a lot but unfortenately I found nothing about the second one. maybe she is the "Priestess of the Dark Dragon"
Yeah, the birdman of wind is Enu, not Enku. So he might be just a npc advisor. But if he was playable, maybe a monk style character. I think the priestess is a villain, so I don think it would be Lamia, but she has a miko style, so maybe. Maybe she is just a damsel in distress of the game. She is holding a bow in the first image, but if she is a playable archer character why no info about her on the site? Can you answer may last question of my second post about the plot? 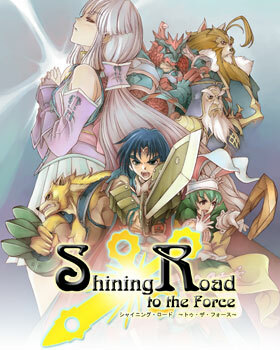 So Shining Road is in the same continyuty of Tears, Wind, Blade and Ark, maybe between Wind and Blade or after blade. It's said in Shining Blade Diocles is dead few time before blade. Yeaj, but Diocles appear in road, I saw him talking in a few screenshots, and tiaris appear in Tears as a tutorial girl, so Road should be before Tears. But except if my memory are wrong, Diocles don't die in Tears. So the game can take place after tears. DiegoMM wrote: Yeaj, but Diocles appear in road, I saw him talking in a few screenshots, and tiaris appear in Tears as a tutorial girl, so Road should be before Tears. these two mobile games ...Shining Road to the Force and Shining Road Priestess of the Dark Dragon are they both one game with the latter being an update or was the second never released? i'm confused. what is everything known about these titles please? Shining Road Priestess of the Dark Dragon are both one game with the latter being an update. Not much is known, unfortunately. Thanks for clearing that up - maybe some more information will come to light some day. Found more pages and information. 1. Ahfen is your tipical swordsman, joyful and with positive thinking. 3. Lamia is the priestess of dark dragon, and its say she is of the family of dark dragon, in this case I believe she is a dragonkin, just like Houmei in Shining Wind. Its say the blood of dragon is become weak after the mix with human blood and their appearance is just like a normal human. 4. Enku is really a monkey beastman and his class is surprisingly swordsman, not monk or wizard like I guessed. Main character of the main story. A boy of treasure hunters (people who unearth the heritage of the ancients and make a living) dreaming of joining the Shining Force. It is a bright natural character that thinks positively about everything and influences people around it. As a human being, we aim to be the first twelve kings of the beasts. Young Wolfling with a golden coat. Reclaim the honor of the Wolflings who disappeared in a case In order to fight for it. For the existence of the "human" that caused the incident be vigilant. A special kind of Pyontaur magician with a powerful magic among beasts. I am not interested in becoming a general, but I am forced to participate and I am not motivated. Are you gradually inspired by the strong desire to be the twelve generals of Afen? A dragon warrior heavy knight with a mask that appears in front of Afen. Maiden of the Black Snake. It is a family of snake beasts, but purebred species have ceased, leaving their offspring in association with humans. The blood is getting thinner and thinner, and the power is getting weaker. The appearance is almost the same as human. It suffers from the pressure as a family that has been in the ranks of twelve generations of kings of the beasts. It has an important role as a Bestia maiden to seal and purify chaos. I use a bow but I can use some healing power. An old general in a battle that makes himself known as one of Bestias's twelve generals. The king Diocles is also present at first sight. The twelve generals led by Lion King Diocless, the beast's country Bestia, are at the core of the world's Shining Force. They were called the "12 Beast Kings", and they were all elite one-to-one thousand. However, the war with the dark forces caused the twelve kings to lose half of them, and Bestia had a deep silence. The war of ten years has passed since the war, and in the central city of Douz, the capital city of Bestia, the holding of the Beast Swords Council has been proclaimed in order to elect a new twelve Beast Kings. One of Twelve General Jutes of the Beast King who suffered deep wounds in the war with the Dark Forces, "Burden Great St. Enku", raised up as a swordsman, seeing the character of the treasure hunter boy "Afen" who was saved on the expeditionary destination as a warrior. And we qualify as a challenger to become a shining force. Afen, a boy who has longed for Shining Force since he was young, travels to the capital city of Bestia. However, he aims to be a beastman's country that respects the old tradition. Various trials were waiting before him who was human. Well, will Afen be the new wind of the beasts' country and move the world of the beasts?